This is the demo site for BygoneSSL. It outlines what can happen when a SSL certificate can outlive one of its domains' ownerships into the next. Well, aside from the fact that the previous domain owner could Man-in-the-Middle the new domain owner's SSL traffic for that domain, if there are any domains that share alt-names with the domain, they can be revoked, potentially causing a Denial-of-Service if they are still in use. 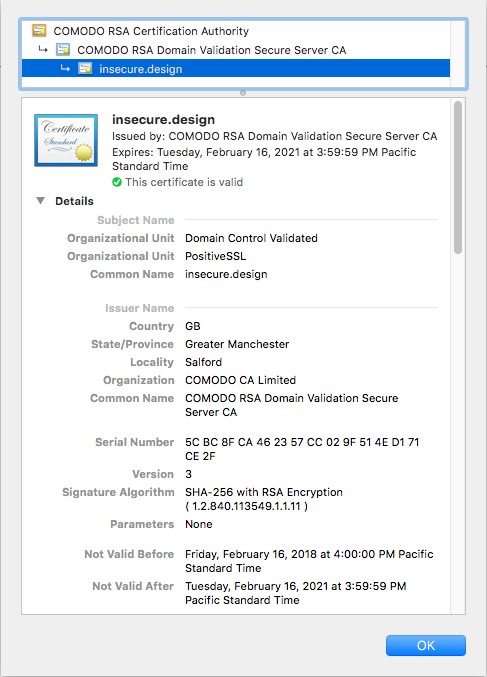 A SSL certificate created before and supersedes its domains’ current registration date. If a company acquires a previously owned domain, the previous owner could still have a valid certificates, which could allow them to MitM the SSL connection with their prior certificate. If a certificate has a subject alt-name for a domain no longer owned by the certificate user. It is possible to revoke the certificate that has both the vulnerable alt-name and other domains. You can DoS the service if the shared certificate is still in use! The CA/Browser Forum, which sets the rules by which Certificate Authorities and Browser should operate, states that if any information in a certificate becomes incorrect or inaccurate it should be revoked. Additionally if the domain registrant has failed to renew their domain, the CA should revoke the certificate within 24 hours. Updated SSLMate’s CertSpotter Log Monitor Tool. Added valid_at to the watch file to be notified of certificates that are Bygone.